And a pedestrian has the duty not to walk out in the middle of a street where there is no crosswalk. The vehicle maintains the right-of-way in that scenario. § 40-6-91 (b) No pedestrian shall suddenly leave a curb or other place of safety and walk or run into the path of a vehicle which is so close that it is impractical for the driver to yield. Pedestrians and drivers are often confused by the meaning of the flashing “Don’t Walk” signal. For pedestrians, it simply means “don’t start crossing.” It does not give drivers who are turning at a green light the right of way. Even on green, turning drivers must stop and wait for pedestrians to cross the adjacent crosswalks. I am reluctant ever to say a jury got something wrong, even when I lose a trial. The jury heard all of the evidence, and the judge told them what Georgia law to apply, and so with regard to an outcome that I don’t agree with or understand, I usually conclude the jury got it right and something else had to have occurred. But I confess, this jury verdict has me scratching my head. Based on the newspaper’s report, and the Georgia law I have quoted above for you, I just can’t explain this one. Unfortunately, it is all too common for a pedestrian to be struck by a car in Georgia, even when the pedestrian is in a crosswalk on a city street. But based on what the jury said in the Gwinnett County trial, does that mean drivers can just mow them down if the orange flashing hand has appeared while the pedestrian is already in the crosswalk? Does a pedestrian who is legally using the crosswalk assume any risk while in it? 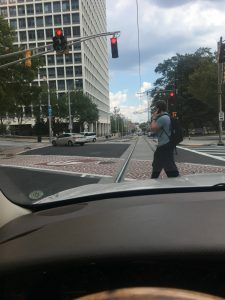 Can a pedestrian who is legally using the crosswalk ever be contributorily negligent while in the very crosswalk put on the street for their protection? I suppose we will wait to see what Georgia appellate courts tell us about this assuming the plaintiff appeals the defense verdict. Maybe the Gwinnett County jury misunderstood the law? As a driver who faces pedestrians crossing Edgewood Avenue all over the place and specifically NOT in crosswalks, I can empathize a bit with the truckdriver. But it seems that Georgia law would offer more protection to a pedestrian who is actually obeying the law and crossing the street within a crosswalk. Robin Frazer Clark pursues justice for those who have personal injury claims as a result of being injured in motor vehicle wrecks, trucking wrecks, defective products, defective maintenance of roads, premises safety, medical malpractice and other incidents caused by the negligence of others. Ms. Clark is the 50th President of the State Bar of Georgia and a Past President of Georgia Trial Lawyers Association and has practiced law in Georgia for 30 years. Mrs. Clark is a Barrister in the International Society of Barristers. Mrs. Clark is listed as one of the Top 50 Women Trial Lawyers in Georgia and is a Georgia Super Lawyer. Robin Frazer Clark~Dedicated to the Constitution’s Promise of Justice for All.